Join us for a baby art workshop for babies to get messy with non-toxic vegetable and fruit-based paints, sponges and stamps. Mommies and daddies will have fun and help babies create their masterpieces. In this workshop, babies can make cute hand print and foot print canvas art and explore colour and paint. The workshop is an amazing sensory experience! 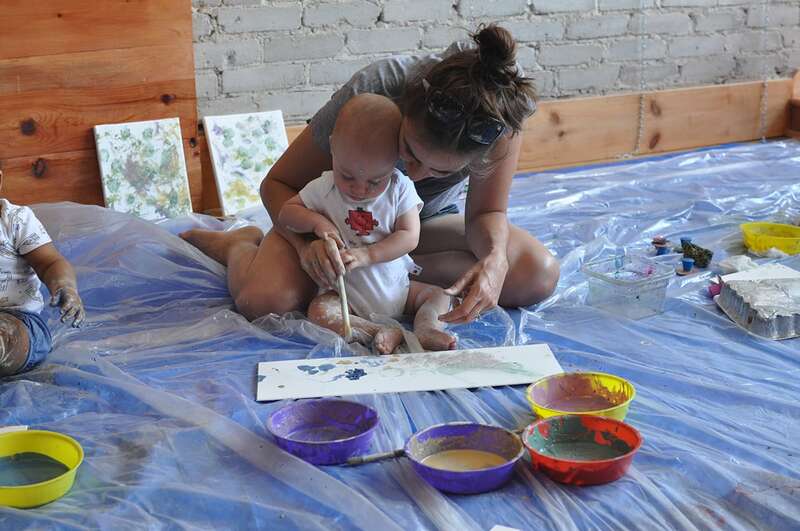 Babies can create on two mini 8×10 canvases or a 9×12 canvas. This is a messy workshop! We do have a large laundry tub to help clean up the babies after the session. We recommend bringing a change of clothes for the baby as well as towel. We also have smocks for the adults if requested. Please note, unfortunately we have limited space in the studio for strollers. If you are able to use a baby carrier or a smaller, compact stroller, this would be very helpful in terms of space limitations. Register in advance. Spaces are limited.